When I acquired my Record T5 technical jack plane and restored it, I was well aware it had lost its 'shooting' handle like most of them do. This simple attachment is essential if you shoot end grain, as it makes the operation much more comfortable and effective. So I decided to make one, except I happened to have a redundant ash (Fraxinus excelsior) file handle. It was a similar shape to the original and I decided I could fit it with a bit of studding so it would screw into the plane side. 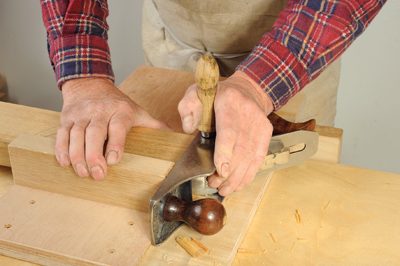 You can do the same thing with any standard No.5 jack plane too. It is easier to find modern metric threaded bolts than old imperial sizes. 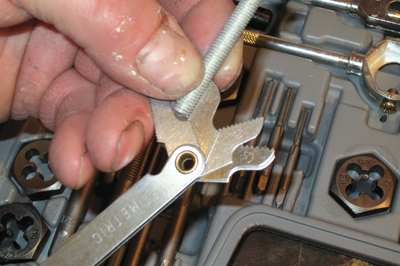 I used the thread gauge from my tap and die set to select a 6mm diameter bolt. 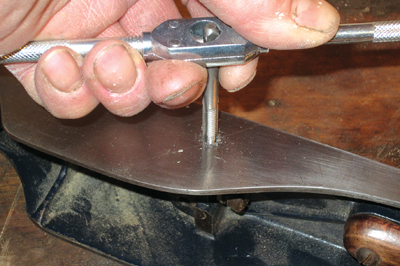 Held in an engineer's vice, the head was cut off and the end filed smooth. For safety, the frog assembly is removed. 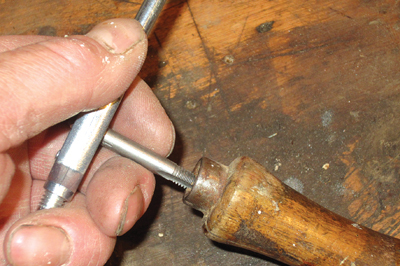 A 5.5mm drill was used to open up the original tapping. 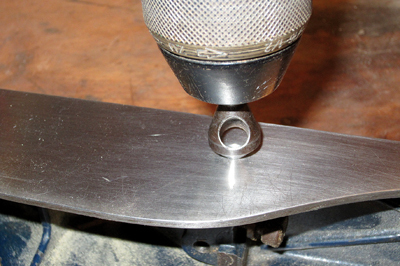 If you are working on virgin metal, mount the body in a drill press after using a metal punch to mark over where the rear frog support casting is. Drill deep enough to allow the tap in to do its job. The 6mm tap is pushed tightly against the hole to encourage it to bite. 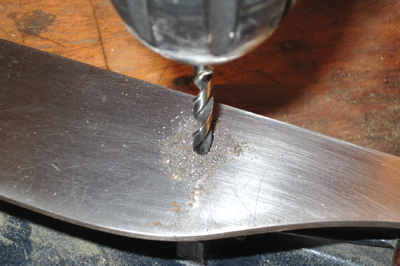 Keep the tap upright and do a series of half turns clockwise; each followed by a half turn anti-clockwise going deeper as it enters the hole; this action breaks the iron that is being cut by the tap and allows it to escape. 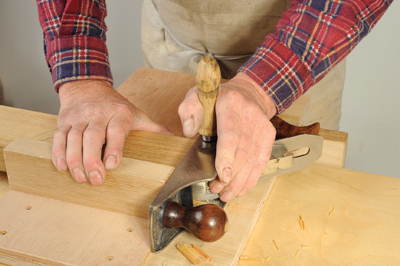 A snail countersink is used to gently smooth the entry to the hole so there is no rough standing edge. This is essential or the plane sides will catch and score other surfaces. This old file handle had a tang hole which needed to be drilled out with a 5mm or 5.5mm drill bit. Then the tap was run into the hole to help the stud to wind into the hole easily. 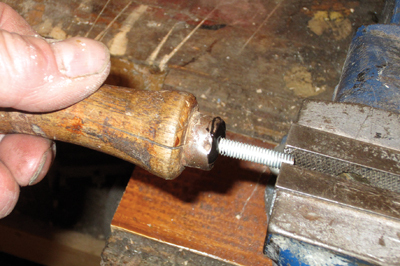 The stud was clamped in the vice and plenty of two-part epoxy resin dribbled into the hole in the handle then wound onto the thread fully and allowed to set. A little too much thread still projected, so I cut off the excess. 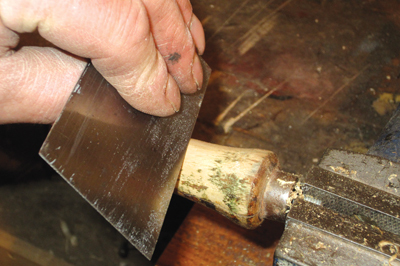 A card scraper was used to clean off the worst muck from the handle, then lightly sanded. Three coats of hard wax oil give it a 'character' finish. Now shooting end grain is much easier!